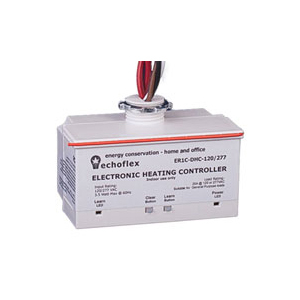 This Echoflex thermostat comes with a variety of firmware and control options. 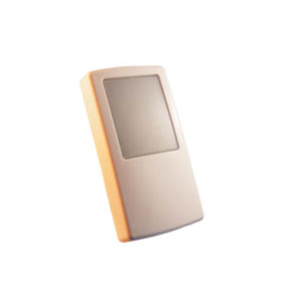 Temperature sensors, switches, key card switches, occupancy sensors, front door and patio door switches can all be linked to the device to provide energy control through setbacks when unoccupiedor shut downs when windows are open and conditioned air is simply spilling into the outdoors. Residential - as simple as switch control - leaving the house turn the switch off to set back the temperature arrive home turn it on. More than one entrance - then make it a three or more way switch. Hotel or Dormitory- link a key card switch to it or the more passive front door/occupancy interlock (see occupancy solutions) to determine occupancy. Have a balcony with a sliding door? Just add a patio door switch and decide how aggressive you want the controller to be - door open = shut down, door open = set back, you choose. The most basic heating is inexpensive to put in but costs the most to run. Many have only basic control and few perform any of the more sophisticated scheduling functions. 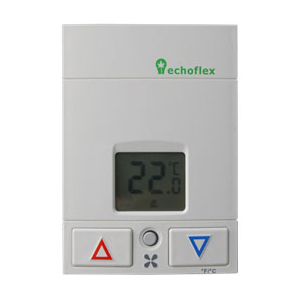 The Echoflex base board controllers allows you to control the temperature and provides unique set back functions as well as setting the temperature limits of the system, for instance control to temperatures of 18C only and hard coding this limit into the device. This controller will learn temperature sensors to perform averaging last one touched, or most or least demand options and will also learn the space’s master switch so that when you leave the space and turn the switch off to turn off lights, it will also set back the temperature. Scheduling baseboards and furnaces can now be done using any a programmable thermostat. Wirelessly enabling this thermostat to propagate on and off signals to control equipment, with a small radio modification, brings time of day savings to the application as well.